INSIGHT: Businesses are generally optimistic about a strong start to 2019, although signs of caution emerge. The first quarter 2019 outlook is generally positive; however, businesses appear to show some soft signs of concern about the direction of the economy. 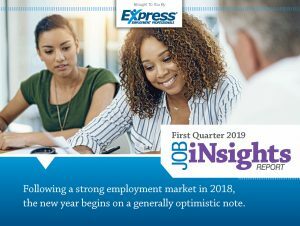 Thirty-eight percent said their employment market is “trending up” for the first quarter of 2019, down from 48% in the fourth quarter of 2018. Additionally, the number of businesses that said the employment market is “staying the same” increased to 53% from 42%, quarter over quarter. Only 9% expect their employment activity to trend downward. A leading trend in 2018 has carried over into 2019—recruiting the skilled talent needed to maintain productivity continues to be a top challenge for businesses across most markets and industries. In fact, 83% of survey respondents said it was either “Somewhat Difficult” or “Very Difficult” to recruit for and fill open positions, which is up from 79% in the fourth quarter of 2018. Fewer than one-quarter of respondents said all their positions are filled. In 2018, long stagnant wages showed signs of life and are overall higher in most pay scales for non-managerial roles in the first quarter of 2019 compared to the first quarter of 2018. In a job seeker’s market, companies must be willing to up the ante when it comes to pay and benefits to attract the best workers. In fact, 49% of respondents expect wages to increase over the next three months—an almost 20% increase over the first quarter of 2018 (41%).